Zest For Gippsland: When Coffee Meets Milk. Gippsland Jersey is a dairy. But it’s way more than that. A couple of good mates and about 400 gorgeous Jersey cows are behind the unique dairy brand. A brand that's managed to bottle the spirit of a community struggling with some very real concerns. Founded in 2016 off the back of a string of life-changing events, Gippsland Jersey was never about making money, at least not for its founders, Sallie Jones and Steve Ronalds. It was, however, largely about making real money for farmers. A small, sustainably run dairy farm just an hour or so out of the Melbourne CBD, supplies the milk for Gippsland Jersey. 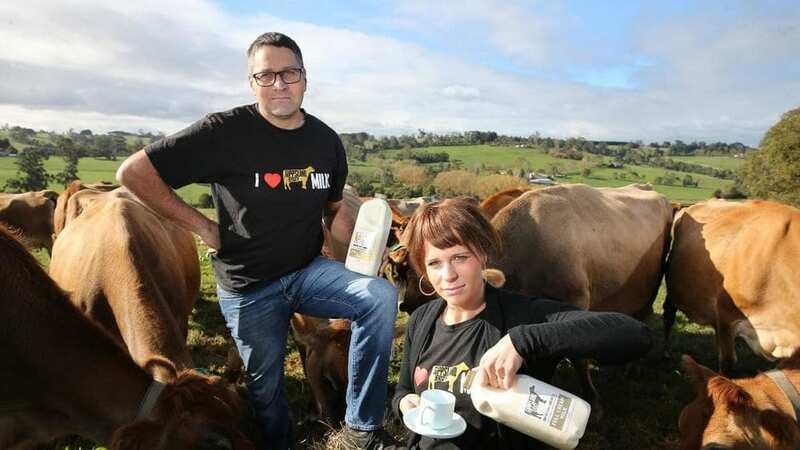 A boutique milk brand, and a business built with a purpose – for demolishing the stigma around mental health, for promoting paying a “fair price for a fair day’s work”, and for expanding the value of community kindness. Fortunately for us, Gippsland Jersey is also very much about milk. Great milk. I arrive at the farm for a little tour on Saturday afternoon. A few moments before the Jersey girls start making their own way into the shed for the afternoon milk. “They are creatures of habit,” Steve tells us as we watch the ladies wander up to the shed independently. The visual reminding me of a crowd waiting for their favourite café to open in the morning. Steve speaks dotingly of his cows, the small Jindivick farm where Gippsland Jersey is based has been in the family for 4 generations. Steve and his wife, Rebecca, purchased the property from Steve’s parent back in 2016. Still very much a family affair, Steve’s retired father is hooning about the property on the ride-on mower the whole time we’re there. I can see why; the farm is stunning. Set back off the main road in Jindivick, a small town in West Gippsland. Endless green pastures rise above the milking shed to meet the low hanging sun in a picturesque tree line that boarders the property. It feels lifetimes away from the CBD, just a hundred or so Ks from the farm. The venture was strongly inspired by the passing of Sallie’s dad, Michael Bowen (also a prominent Gippsland Dairy Farmer). Michael tragically took his own life in 2016 following 3 years of living with depression – unfortunately not an uncommon trait of a career farmer. Isolation, long hours, economic instability and constant anxiety over their livelihood are all contributing factors to a farmer’s suffering mental health. One of the major motives behind the Gippsland Dairy brand was to use their premium product to drive awareness for mental health and make a ripple in the movement toward opening conversation around it. Sallie’s life was eternally shook after the loss of her hard-working father. 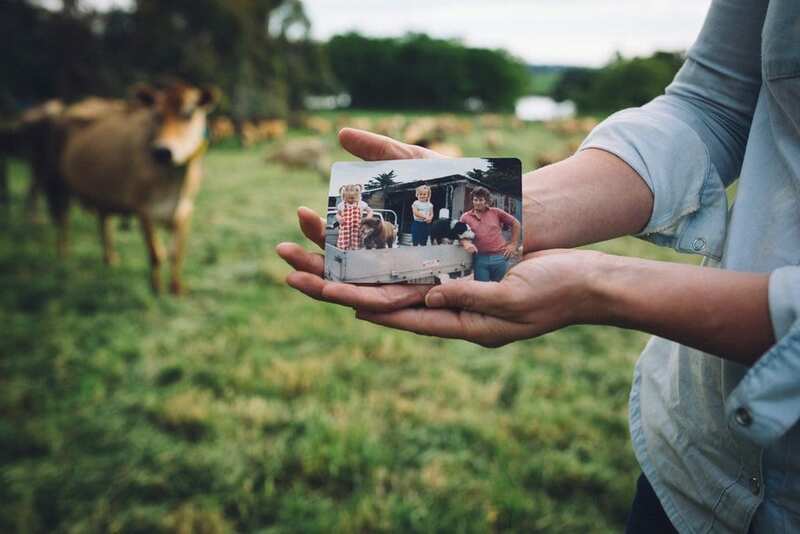 A huge influence, a hero and an inspiration – Sallie’s dad was a bold and compassionate man and a big presence in the Gippsland farming community. He made a splash where he could. The Gippsland Jersey plight is as much his legacy. “Sallie doesn’t fall far from her dad’s tree”, Steve speaks fondly of his business partner's passion. Sallie, a Marketing and Public Relations professional with a deep heritage in dairy farming, wanted to do something big after losing her dad. Make a noise about mental health. Make a noise about fair pricing. On behalf of her dad, and Steve, and a whole string of farmers whose premium Jersey milk was not stacking up in the market against the unfair prices of the supermarket chains. So, they set out to create a brand and a brand new way. And Gippsland Jersey was born – to drive change, and distribute some bloody good milk. Steve’s jerseys are producing creamy, milky-milk – the kind of milk you expect from well-fed, relaxed Jersey girls. Jersey cows are a heritage breed know for their smooth, silky milk high in nutrients such as protein, calcium, and packed with vitamins – much higher in A & B1 than other milks. Jersey milk is also known for its higher fat content – and this is a good thing when it comes to milk, trust me. It’s what gives it the flavour, it makes a great butter, cheese, and, best of all, stretches smooth with great texture when heated. Baristas love the silky Jersey. It’s no wonder they’re happy, quality milk-producing cows out here. The rolling paddocks behind the dairy, where the cows roam free, are jade green and rich. There’s so much grass on the hill that it’s hard to imagine Victoria is still suffering drought conditions in some parts of the state. As the sun locks into magic hour we take a tractor ride up the hill to look down on the dairy and lay with some of the cows. Steve highly recommends laying in the grass with the cows as they’re grazing – he swears it’s a form of meditation, a natural anti-depression tonic. I can vouch for it. Jersey cows are widely known as the friendliest breed of cow, so you can get up nice and close with them, and hear their magic jaws tearing up the nutrient rich grass. Grass that will work its way through these gorgeous, natural milk-making agents, pass through their udders, and be given up graciously to Steve and his farmers at some ungodly hour of the morning. It will then be sent off fresh to a small local processor where it’s tested, pasteurised, separated and homogonised before being packaged in the socially sensitive Gippsland Jersey branding, boxed in boxes by local sustainable box maker and shipped off to the stores to grab a fair price. It doesn’t end there though. A percentage of the profits from Gippsland Jersey (and it’s not a lot, remember this is a social enterprise with benefits, not a corporate) get popped into the ‘kindness kitty’. The Kindness Kitty is where Steve and Sallie dip from when they see a farmer in need. Just another part of their ‘ripple effect’ movement. It might be helping them out with promotional stuff, helping pay bills, or even something as simple as shouting them a coffee and a muffin if they’re having a hard day. So, as I look into the big brown eyes of this beautiful Jersey cow– let’s call her Daisy, she looks like a Daisy – I not only see a friendly face, I can see a whole community of friendly faces striving to make a glass half full of a tough situation, and it makes every chew of Daisy’s invaluable. Thanks Gippsland Jersey for opening your world to us and, more importantly, for making our coffee taste even better! And anyone keen on helping out the cause, you know what to do. If you see a bottle of Gippsland Jersey in your local supermarket or shop, pop it in the trolley. For more visit www.GippslandJersey.com.au and get behind the Gippy gang as they support farmers and raise awareness for mental health, and give us some really, really good milk.